HAPPY HALLOWEEN! : A wondrous assortment of costumes could be seen at Saturdays Halloween parade and party at the Princeton Shopping Center. 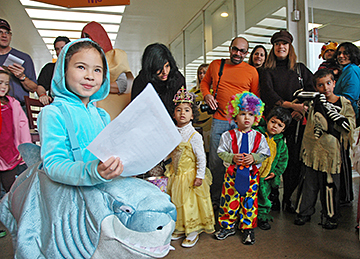 Here, Marina Wheeler (left), age 5, has won the second place award in the 4 to 6-year-old category for her shark costume, while others eagerly await their results. Members of Township Committee and Borough Council voted unanimously on Monday night to approve the formation of a joint commission to study sharing additional services and/or full municipal consolidation. This is a required first step for any municipalities wishing to avail themselves of the states programs and subsidies supporting municipal consolidation. If there are no solutions to the building, it has to come down, said Superintendent Judy Wilson referring to the older section of the Valley Road Building in a discussion at last weeks meeting of the Board of Educations Facilities Committee. I have been an absolute proponent of consolidation, said Governor Jon S. Corzine in a Monday morning press conference call with representatives from weekly and monthly newspapers throughout the state. The good news, according to Nobel Prize-winning economist and Princeton Professor Paul Krugman, is that we are not replaying the second year of the Great Depression. Three candidates are vying for two seats on Borough Council, with the election set for next Tuesday, November 3. Democrat Jenny Crumiller, Republican Linda Sipprelle, and Democratic incumbent Kevin Wilkes all reflected on key concerns facing Princeton Borough in separate telephone interviews. Princeton University Professor and photographer Emmet Gowin took audience members on a meander through his artistic life and legacy last Saturday in a completely packed McCosh 10 auditorium on campus. Brian Leung didnt get the chance to hit the road much this summer as he prepared for his sophomore season with the Princeton University mens cross country team. Princeton University Orchestra conductor Michael Pratt always starts off his ensemble’s season with a demanding program. No matter how many seniors have graduated the previous spring, the University Orchestra manages to begin the year focused and concentrated on performing concerts of music which would challenge even the most experienced players. This was the case this past weekend as the orchestra presented the first concerts of its 2009-2010 season in Richardson Auditorium. The performance Saturday night (the program was repeated on Sunday afternoon) featured the music of Maurice Ravel, Sergei Prokofiev, and Dmitri Shostakovich, as well as one of the more delightful works of Wolfgang Amadeus Mozart. The program also featured two soloists with strong Princeton connections. Ever consider giving more meaningful, less expensive gifts that someone will keep for the rest of his or her life? Consider quality over quantity. Isnt it wonderful that there is real wood  an alternative to chipboard and plastic? And usually for less than the new copy itself.